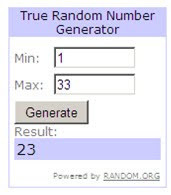 There were 33 comments in total for the giveaway and I used a random number generator to get my winner! Claire from cakes and bunting! who said she would buy the cow rolling pin! Well done Claire, you win the £50 voucher for CSN Stores! I will email you the details and please let us know what you spend the voucher on! Thanks to everyone for taking part and to CSN Stores for sponsoring this giveaway!